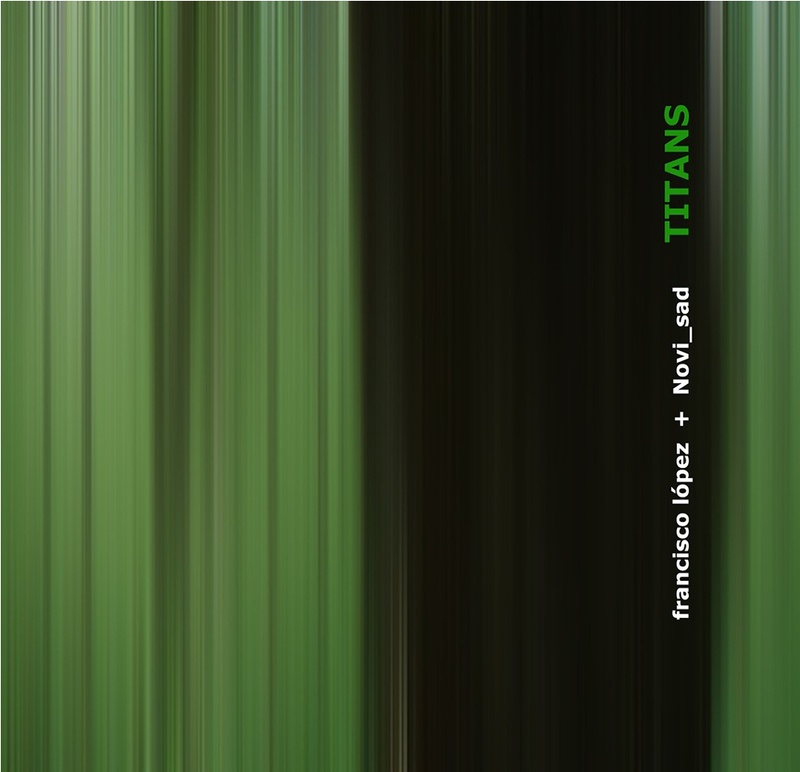 ”Titans”, a split cd by Novi_sad + Francisco López is just out by GH Records. Limited edition of 500 copies and housed in a 4 pages digipack. Sound artists Francisco López [Spain] and Novi_sad [Greece] have explored together the blurred territory between reality and the creation of self-contained sound environments through a long process of transformation of sonic materials. Working with the same shared field recordings as source materials carried out in the region of Ancient Olympia in Greece, they have created two individual pieces with extreme dynamics, at times obscure and dense, but laden with hidden complexity and a few surprised for the most adventurous listeners. These pieces have been presented in the context of a live performance as part of Olympia International Festival, July 2010. Manipulating the same source materials – environmental recordings made in Greece’s Ancient Olympia region – López and Novi_sad (real name Thanasis Kaproulias) have created entirely different soundscapes, both compositionally brilliant and psychologically engrossing (high-quality headphones are recommended). In Untitled #249 the Spaniard lets a sublime faraway chorale evolve from initial subsonic activity, subsequently shifting the frequency balance through the use of spiky highs and metamorphic radiations, a veritable flea market in hell. The texture becomes progressively thinner until we’re left with barely perceptible signals at the borders of tinnitus preceding a classic finish in total silence. But what a difference between this breathtaking suspension and the boredom elicited by today’s abusers of hush. Novi_sad’s Ellipsis leaves the original substance visible enough, the sequence of events beginning with a spectacular rumbling storm with relative downpour. Dexterous equalization highlights the “right” hues in the drumming reverberations of the water, and brings fantastic results in at least two extended segments, which sound respectively like a mesmerizing initiation rite and a superimposition of every existing type of chord played by a gliding string section. The volume rises to full throttle only for the ecstasy to be abruptly cut short at the end, leaving us pondering for quite a while. To quote a favourite philosopher of mine, come on the amazing journey and learn all you should know. A milestone release from a splendidly-named label. So, elsewhere I say something about musicians who release a lot and who have quite a following, but not necessarily change their tune often; the name of Francisco López is mentioned. Now, to be honest, he does change his tune from time to time. In his early work on CD things were incredible soft, but there were more audible releases with field recordings, such as ‘La Selva’ and ‘Buildings [New York]’. A short time Lopez used short sound samples of heavy metal music, which didn’t entirely convince me. In recent years he seems to be using some kind of computer processing more and his work is more audible, employing deep end bass sounds. By now there have been quite a few of those releases and ‘Titans’ is not different. One piece by López and one by Novi_sad, the upcoming star of the same scene, but both use the same ‘environmental sound matter recorded in the Ancient Olympia region (Greece)’, hence the title. In the López piece this is all used to create a very very low humming bass sound – like inside an airplane engine and some higher/mid ranged processed sounds. Quite a nice piece, but perhaps also a bit too regular for Lopez: it doesn’t particular stand out. Novi_sad’s piece is a like in approach towards the sound, but seems to have a more narrative character, with some abrupt changes and slow build ups and break downs, whereas Lopez goes for a more minimal approach towards the composition. Novi_sad’s piece I thought was a bit nicer than, especially because of this narrative, dramatic character. A radioplay like piece without any words. While the title is in reference to the source material (field recordings in Ancient Olympia, Greece), it also serves as an appropriate name for these two monumental artists coming together. Linked only by the use of the same raw materials, both Lopez and Thanasis Kaproulias create very different, yet powerful worlds of sound. Lopez’s contribution, “Untitled #249,” begins extremely quiet, remaining mostly silent until the most distant spectral drones slowly come into focus. In the earlier moments, there’s more of a ghostly warmth than the clinical digital sound I associate with Lopez’s work. It eventually transitions into sharp, digital realms and harsher textures, though above an almost rhythmic clattering. The dissonance peaks around the middle of the 30 minute work, with metallic scraping noises amidst a disorienting haze. Once it goes as loud as it can get, it slowly fades away, retreating and ending in a sparse, open field of sound, with the tiniest fragments of what was just heard remaining. Novi_sad’s half of the album, “Ellipsis,” relies less on subtlety and more on variation. While it begins with slow motion, hollow noises and distant, almost thunder-like crashes that reverberate into infinity, it soon expands outward and allows the underlying field recordings to be heard. Transitioning from rushing water into a swarm of insects (though heavily processed), it builds layer by layer in intensity. However, as the noisier elements are piling up, an almost melodic undercurrent surfaces: possibly a bit of folk music that found its way onto the tape, which is mangled into a beautiful drone, continuing to echo within caves of rushing water. The piece ends in the exact opposite way of Lopez’s: it sounds like all of the previous layers of noise are stacked atop each other to create an intense cacophony that only ceases when the disc does. Even though the only thing linking these two pieces are the source material, with each artist processing the field recordings in drastically different ways, the two pieces feel like they belong with each other. While their approaches to utilizing the source material may differ, the undeniable strength of both the young composer and the prolific veteran is prominent. Francisco Lopez and Novi_sad certainly don’t need too much introduction in the contemporary enclaves of experimental electronica. In “Titans”, again, they prove their incommensurable talent, unraveling ambient sound scores through a long process of transformation of the materials used. Field recordings made in the region of Olimpia in Greece, are articulated and enacted using extreme dynamics, organized in obscure passages that are thick and not easily encodable, almost undecipherable in the original captures and the subsequent studio manipulations. The title itself refers to the original contents and the region where the recordings were collected, but also reflects the task of exchanging opinions and strong poetics in a clash-encounter of attitudes. The titanic strength is also that of slow deflagrations, of hollow and subdued noises, of an insect swarm, elements that pile up, water currents and echoes, roars and tumultuous cacophonies. Metallic noises and dissonances, adapted fragments of a choral accumulation of the elements. Full volumes, falls and restarts, suspensions and jumps complete the list of imaginative scores collected and sorted here to compose an exemplary suite, where the starting material is the same for both and the results equally magnificent, showing common but also different sentiments, affirming and negating at the same time how a “capture” carries in itself a sound genome, a particular resonant frequency, a sound ripple that propagates unstoppably. Such a title, Titans, for this listening pearl signed by the renowned sound artists Francisco López and Thanasis Kaproulias aka Novi_sad, is not an act of haughty self-referentiality, even if I could say it could fit to their skills, but it’s strictly connected to the inspirational place where they moulded the sonic material they consolidated in different way: the legendary Ancient Olympia region! In particular Titans (also known as white clay man as according to some studies their name derived from a Greek word meaning “white earth”) are those gigantic deities who ruled the world during the so-called Golden Age, an era which was ended by Prometheus, a Titan himself, when he gave to the mankind the gift of fire and other arts and crafts. By the way, according to some essayists Titans had a central role in the primordial stages of Ancient Greek shamanism: they were normally represented by men covered by white clay, who evoked the strongest cosmic and natural forces, able to destroy other ones such as the pleasure. Such an attribute was called back in the ritual based on the episode of Dyonisus’ cannibalism by Titans themselvels for instance. Some listeners with a lively imagination could hear a sort of translitteration of Titanic powers in this split cd: Francisco López’s 30 minutes lasting track starts with thundering ultra-low frequencies nearby the threshold of hearing, which seem to rise from the bowels of the earth, before the sound gets crammed with abrasively sinister metallic scratches, whose friction with eardrums gets gradually silenced till the moment when the Spanish sound artist plays with imperceptible hums, babbles and chirps so that it seems the titanic force of its sound has shaked the whole audible range till when the listener has been traumatically taken back to nature. Novi_sad’s “Ellipsis” is really impressive as well: Novi_sad uses the same source materials, but melts them in a completely different way. The thundering low frequencies by Senor López have been replaced by the recording of a real storm and when he overloads the sound space with proper thunders, you’ll almost feel the electric atmospheric activity related to such a weather condition, while the hypnotical sonic sculpture based on an intense teeming of metallic ground noises sounds to be swept by a persistent corrosive wind. Analogies and bizarre similarities with nowadays Greek financial crisis, which is hypnotizing many people injecting rich doses of paranoia, come almost instinctively as well; I’d go so far as to say that the cover itself with those repeated and close green and black stripes could be considered a reference on it as well as the general atmosphere of this record, filled with a sense of deep-toned oppressive neurosis whose terminal stage cannot be but nature. Hace unas semanas recibí por cortesía del sello valenciano GH Records una copia de este trabajo compartido por nuestro viejo conocido Francisco López y el artista griego Novi_sad. Dos composiciones de aproximadamente media hora de duración componen esta grabación, que cómo peculiaridad, están formadas partiendo de la misma materia sonora: grabaciones en el entorno natural de la región de la antigua Olimpia en Grecia durante la primavera del año 2009. “Untitled #249“, el track de López comienza silencioso casi imperceptible, y aseguraría que su intensidad va en aumento hasta el minuto 9:50 dónde (y lo digo para advertir al oyente) recibiremos un pequeño susto al recibir un cambio de sentido: el sonido ambiental, vaporoso y frío de la primera parte deja paso a un cortante y gélido sonido metálico, variante y mutante. A esta base se van sumando nuevas capas, en algunos casos altamente graves (minuto 12:45) en un momento en que casi se tornan necesarias. En algunos pasajes a lo largo de la pista parecen apreciarse sonidos animales, pero en este momento no me aventuraría a afirmarlo ya que es dificil apreciar si esta fuente es correcta. Sea como sea, a partir de la mitad de la pista, ésta parece comenzar a morir, abandonado los graves, silenciando los agudos y dejando al oyente en calma, atento a los detalles mientras el sonido se convierte en un ligero susurro… Maestría, tal y como viene siendo habitual. “Elipsis“, el tema de Novi_sad, comienza opuesto a su predecesor: grandes dosis de sonido grave, tormentoso y drone que lo hacen extremadamente más cálido. Ya en los primeros minutos, sorprende cómo la misma fuente sonora puede generar materiales opuestos en función de su procesamiento. Ahora bien, al sonido procesado se unen elementos insertados de forma directa tales como torrentes de agua (quizás fuentes…), silvidos provocados por el viento, llantos de algún recien nacido y (ahora si confirmo mi sospecha anterior), cantos y murmuros de aves. Una de las partes que mas me gusta de este segundo track es la que transcurre entre el minuto 9 y el minuto 16, donde las muestras sonoras de tonalidad grave se unen a una especie de muro de ruido blanco de intensidad en aumento llegando a un climax allá por el minuto 15 y decayendo en el 16 para dejar paso al tramo más natural y falto de procesamiento de la pista: los sonidos naturales se adueñan de la composición para que en su tramo final se una un colchón casi musical (recuerda un poco a música oriental sin serlo) de tremendo efecto relajante. Música para el alma. Inmejorable trabajo que recoge dos grandes piezas dentro del marco sonoro que, particularmente, más me gusta de los trabajos de López y que Novi_sad ha sabido complementar. Quiero desde aquí agradecer a GH Records su amabilidad y felicitarles por la edición de este trabajo, cuidada tanto por dentro, como por fuera (su elegante digipack hace de este disco una obra de arte también visual). Debo reconocer que la primera vez que escuché hablar de Francisco López fue a la hora de preparar esta reseña. Ni su nombre me sonaba remotamente, ni por ende, su estilo de música así como su archiconocida reputación. De entrada lo que puedo decir es que he alucinado con la trayectoria de este señor, y sobre todo con el extenso catalogo de CDs que podemos adquirir bajo su nombre. Mirando en su pagina web, es fácil perderse y liarse entre la colección de las antiguas cintas (un total de 43), WEB releases (22, que supongo serán tracks o discos de descarga por web), vinilos (14), DVDs (4), y la asombrosa cantidad de los típicos CDs (70 ni más ni menos). La historia de Francisco López comenzó en 1985. Desde entonces su carrera no ha hecho más que crecer y crecer, editando discos con mas de 170 sellos discográficos repartidos en 50 países, colaborando con mas de 100 artistas y realizando espectáculos en directo en todo el mundo(su punto fuerte), así como actuando en museos, galerías y festivales. Este madrileño, aparte de su afición a la música, es también un reconocido científico dentro del ámbito de la biología y la dinámica de sistemas. Como buen científico que es, la música de Francisco López se extrapola del trato habitual que ésta recibe por otros músicos para introducirse en un mundo nuevo donde cada elemento sonoro es estrujado y manipulado como si a a nivel microscópico se tratase. Se trata de una búsqueda interior para deformar el sonido de tal manera que llegue a mimetizarse con nuestras emociones y percepciones. No es música para escuchar en frío, es música para observar, para ver, y sobre todo pare dejarse llevar. En sus directos lo importante es que la gente olvide donde está, que cierre los ojos (incluso con vendas) y con la menor luz posible poder ser conducidos a oníricos mundos a través del uso de los sentidos. Por otro lado, para este CD contamos con la aparición a partes igual de la banda griega Novi_sad. Este proyecto basa su trayectoria en los mismos pilares que Francisco, con lo cual esta edición está más que justificada. Ambos experimentan con la grabación de sonidos en sus viajes para luego conformar de una manera totalmente deformada el resultado que podemos escuchar en sus trabajos. Para esta grabación en concreto, “Titans”, tanto Francisco López como Novi_sad basaron sus grabaciones en la antigua región de Olympia. Con esas fuentes sonoras, trabajaron para crear un track cada uno de ellos, de una duración aproximada de 30 minutos. Debo reconocer que no soy muy fan de la música experimental, precisamente por lo que he dicho un poco anteriormente, que es una música muy especial, muy cerrada y sobre todo porque fácilmente puede resultar monótona. En esta ocasión, tengo mis emociones divididas. Por un lado, la sensación de tumbarse en la cama, con los cascos puestos, en completo silencio y en total oscuridad, escuchando este disco, es realmente una sensación única y enriquecedora. De hecho, esta es sin lugar a dudas su mayor virtud, así como el mayor defecto. Esto quiere decir que en muchas ocasiones, o mejor dicho, para muchos de aquellos que escuchen el disco, si no se realiza esta practica no se podrá apreciar ni la mitad de la mitad de los detalles sonoros. Por ejemplo, ‘Untitled #249’ comienza tan sinuosa y silenciosa, que hasta casi pasado 3 minutos es difícil distinguir el sonido del silencio. Otro de los problemas que he encontrado es que ambos temas tienen una evolución muy lenta. Casi siempre, sobre todo Francisco López, se agarra a la técnica de comenzar con muy poco instrumental, para ir añadiendo gradualmente más y nuevos sonidos… Novi_sad también, pero se me ha hecho mas diverso. Con esto queda claro que el track que más me ha gustado ha sido ‘Ellipsis’, sobre todo desde la parte mediahasta elfinal, porque en general tiene un sonido más industrial, más definido y más ameno. También es más ruidoso, con lo que no llega a ser tan relajante como el de Francisco. Realmente es muy difícil comentar el contenido de tracks de estas características. Lo único que puedo decir es que se trata en ambos casos de un sonido más cercano al dark-ambient que a otra cosa. Cierto es que la etiqueta de experimental le viene perfecta, pero más por la técnica de producción que por la composición de los tracks. Hemos hablado de que ambos artistas graban secuencias de sonido en sus viajes, que posteriormente utilizan en sus trabajos de estudio. A esto he de añadir que realmente se hace muy difícil distinguir nada de lo que estamos escuchando. En el caso de Francisco López la deformación, distorsión o manipulación es más que patente. Es imposible saber en que fuentes sonoras se ha basado. Novi_sad también lo hace muy bien, pero deja algunos sonidos más claros, sobre todo algunos que corresponden a pasajes nocturnos, como el canto de algunos insectos y similares. Bajo mi punto de vista, estamos ante una apuesta bastante arriesgada por parte de GH Records, por dos motivos; por el el estilo experimental duro y puro que en ocasiones, como en esta, puede resultar un poco denso, y por tan sólo constar de dos tracks, de una duración cada uno de ellos más que considerable. Sin embargo GH Records vuelve a sorprendernos por su amplio campo de visión a la hora de editar y seleccionar sus discos. Un trabajo recomendado para viajeros noctámbulos que deseen sobre todo experimentar sin complejos.